With version 2.1.0 not released until early in October, September saw very little change in the OS breakdown on the PlayBook, as the vast majority of users were already running the latest version. As with last month 99.6% of users were running OS 2.0.0 or higher, and 98.6% of users were running 2.0.1 or higher. This data was taken from downloads of the popular PlayBook strategy game Pixelated. 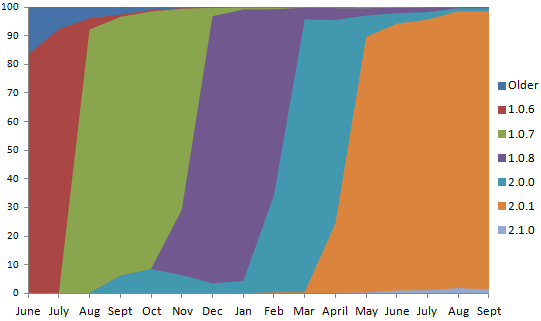 Data shown on the chart is from the beginning of June 2011 through the end of September 2012.